Skoardy.com » Blog Archive » Old is the new New! Over the last few weeks, I’ve tried out a whole bunch of different multi-player Minecraft servers. The one I was playing on previously closed its doors and left me without a mud-hut to call my home. So I went a-hunting and found a shed-load of idiots for my trouble. There’s an awful lot of servers out there being run by people who definitely have no business being in control of anything more complex than their own bowel movements (and some of them made me wonder about that, too). Eventually I did come across a server that was both nippy enough to use and had a bunch of regulars that didn’t have me tearing chunks of my hair from the roots. 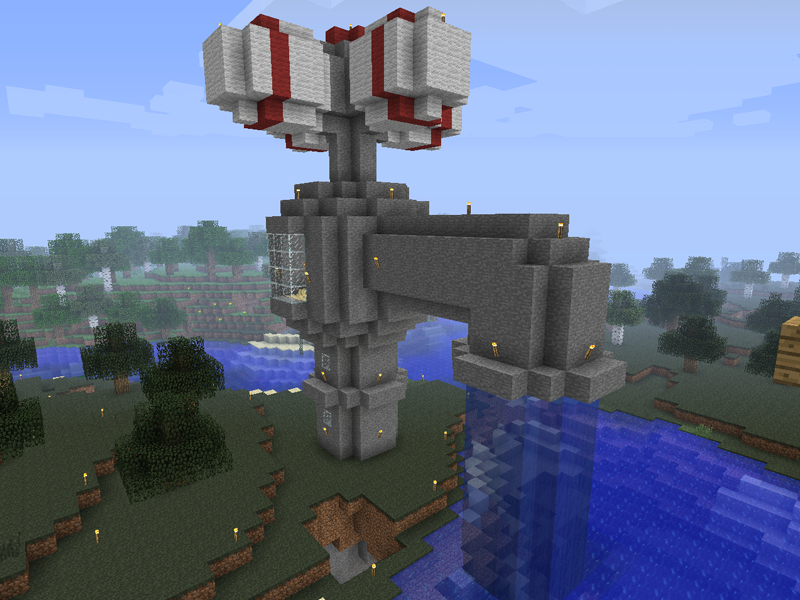 From now on, all my Minecraft builds and screenshots will probably be coming from there. My first build on the new server was to recreate a favourite of mine. I wanted to quickly organise a base of operations and so I found a quiet lake and rebuilt my little ship. I’ve called it the ‘Clipper’ since it’s far too small to be a galleon. 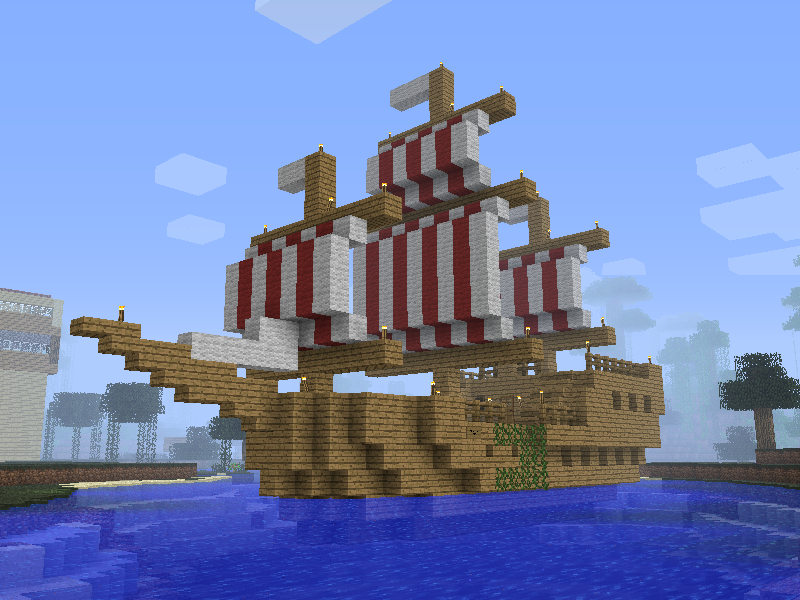 The only real change between this one at the old one is that the upside-down half-blocks smooth out the bowsprit a little, I’ve kitted out the cabin with a workbench, bed, forges and storage, and below deck has been converted into a treasure room (it’s where I keep my gold blocks, naturally – currency on this particular server). While the old ship used to require you to board via a secret tunnel hidden in the mine below the lake, now the player can now simply swim up to the ship and clamber up the side, thanks to the vines added to the game. Ah, progress. After I’d settled in the Clipper, I started on a more surreal build. This time I decided to create a huge retro-style tap (or faucet, for my imaginary American visitors). I went with smooth stone for this build. Didn’t have the resources to be too literal and make it out of iron blocks (plus they look like lumps of porcelain if you ask me). The stem, body, spout and handle are all hollow so the structure could be used as a base if you wished. The handle make a great place for storage chests, and you can earmark each for the four directions for specific items. I’ve more to show from this server so I’ll probably be posting fairly regularly (well, you know, regularly for me – say once or twice a month). See you later. Update: A schematic of the Clipper Ship is available to download. Check out this post for more details. Update 2: A schematic of the Tap is also available to download. Check out this post for more details.